What is the Land Speed Record? The British Flying Mile land speed record is a resilient, elusive record which has stood since 1927. Sir Malcolm Campbell reached a speed of 174.224 mph in his specially-built Napier-Campbell Bluebird on Pendine Sands on the south coast of Wales. His momentous achievement has stood the test of time and remained unbeaten for almost a century. The rules are simple: the driver has to complete two runs of a measured distance (in this case, one mile) in opposite directions within an hour, and the average speed of the two runs (known as ’passes’) is used as the benchmark. As a practical example, if the first run was 200 mph and the second was 190 mph, the calculated speed would be 195 mph. When it comes to world-beaters, there are several classes of land speed record – including motorcycles, electric cars and diesel engines as well as dozens of sub-classes. Perhaps the most famous of all land speed records is the Absolute Land Speed Record, judged as the highest speed achieved by a person using a wheeled vehicle on land. Official FIA flying start regulations are used and, again, the run is measured over two passes in opposite directions over one mile. To win the record, the new time must beat the existing record by at least one percent. Until Idris attempted the Flying Mile, the British record had what is essentially a two-and-a-half year history! Idris, of course, isn’t driving a car from the 1920s. He’s driving a brand-new £200,000, 6.0-litre, twin-turbo, W16 (two V8 engines bolted together), 626 bhp Bentley Continental GT Sport that can power from 0-60 in a shade under four seconds (and 0-100 mph in nine). At full chat, it can hit 206mph. Will he break a record that has stood for almost 90 years? There’s only one way to find out…! Just how fast can man travel? The maximum speed limit on British roads is 70 mph. A Formula One car reaches speeds in the region of 220 mph. A Boeing 747 can cruise comfortably at 575 mph. The US Air Force X-15 jet has reached Mach 6.72, or 4,250 mph, but that’s nowhere close to the fastest man has travelled. The crew of Apollo 10, on re-entry into Earth’s atmosphere, attained a maximum velocity of 24,791 mph – otherwise known as Mach 32.5, 6.88 miles per second, or 0.0036% of the speed of light! Space travel aside, the quest for absolute speed has been unrelenting, competitive, sometimes fatal, but always utterly enthralling. In the formative years of the motor industry, speed was the primary – only – factor that sold cars, as it was one of the least subjective ways to establish automotive superiority. Safety was entirely disregarded as a selling point, as was economy, comfort and equipment levels, the very factors we hold so dear today. Back then, it was a case of ‘who can go the quickest’. In the ‘20s and ‘30s, the land speed record was predominantly held by road-going cars (albeit modified to some degree) but it soon became the domain of cars designed and engineered for speed above all. After the Second World War, a number of motoring pioneers like Art Arfons and Donald Campbell started to experiment with jet engines, moving away from engines that routed power to the axles which was deemed – and proved – to be limiting. Jet engined-vehicles use forced induction for their power rather than using internal combustion to power the wheels. Using turbojet and rocket power technologies in a car was always going to yield extraordinary results, providing the designers, scientists and builders could harness such power through the axles without literally taking off. In the first decade of the 20th century, the French traded records in electric cars under the auspices of the Automobile Club de France (ACF). But when steam and later petrol-powered cars became more popular, the likes of Charles Rolls, Henri de Rothschild and the Vanderbilt family got involved. Records were set, broken and re-broken, some ratified by the ACF and some not. And while the British, Americans and French were all claiming records, there was no internationally-recognised body able to rule, judge, time and most importantly ratify these attempts on the land speed record. The successor to the ACF, the Association International des Automobile Clubs Reconnus (AIACR), which itself was the forerunner of the FIA, determined the rules that we live by today. The record should be the average of two passes within a set time in opposite directions to negate any advantageous effects of wind and gradient. While the British Royal Automobile Club (RAC) agreed, the Americans didn’t because they were annoyed that the French wouldn’t recognise the American Automobile Association (AAA) as an officially-sanctioned timing organisation. Again, records were traded over the next 15 years or so until the mid-‘20s when London engineer Ernest Eldridge set the land speed record on an open road, the last man to do so, in July 1924. Driving a one-off FIAT called Mefistofeles with a massive 21.7-litre inline-six A12 aero engine, he reached 145.89mph (234.98km/h). Barely two months later came the all-dominant age of Malcolm Campbell. Between September 1924 and September 1935, Campbell set the land speed record nine times, from 146.16mph (235.22km/h) in his 350bhp Sunbeam to becoming the first man to drive at over 150mph in July 1925. He hit 174.88mph (281.44km/h) in February 1927, and a year later he topped 200mph with a run of 206.95mph (333.04km/h). From February 1931 to September 1935, the record was his and his alone. The speed crept up incrementally through 246.09mph, 253.97mph, 272.46mph and 276.81mph until he reached the 300mph holy grail in September 1935 with a measured run of 301.12mph (484.59 km/h) in his Bluebird equipped with a 36.7-litre supercharged V12 Rolls-Royce aero engine. The record stayed in the UK for the next 30 years, traded between George Eyston and John Cobb, but in the mid-60s the Americans got involved – and not without controversy. Pro racecar driver Craig Breedlove hit 407.44 mph (655.71 km/h) in July 1963 in his car ‘Spirit of America’ but a) it had three wheels and b) the jet engine didn’t supply power to the axles, so it was deemed unofficial. In July 1964 – in keeping with family tradition – Malcolm Campbell’s son Donald set the official record at 403.10 mph (644.96 km/h) in his turboshaft Bluebird CN7 in Australia. He was disappointed that he didn’t beat Breedlove’s benchmark. In 1983, British dominance returned in the shape of Scottish entrepreneur Richard James Anthony Noble OBE. His autobiography is entitled ‘Thrust: The Remarkable Story of One Man’s Quest for Speed’, and the title says it all. Designed by aircraft engineer John ‘Ackers’ Ackroyd, Thrust2, powered by a single Rolls-Royce Avon engine, was driven by Noble at the Black Rock Desert, 100 miles north of Reno in Nevada. On October 4, 1983, they set the record at633.47mph (1,019.47km/h) which stood for 14 years, until Noble wanted another try. Working alongside Glynne Bowsher, Ron Ayers and Jeremy Bliss, Richard Noble designed and developed ThrustSSC (Super Sonic Car); a most extraordinary car of truly epic proportions: ThrustSSC burned through four gallons of fuel a second. By way of comparison, Concorde, at full power, burned through 0.8 gallons a second. Back at the Black Rock Desert, the car set two records in very quick succession. On September 25, 1997, it set the absolute speed record of 714.14mph (1,149.29km/h) and – barely three weeks later – the team set the record that stands to this day. Driven by Wing Commander Andy Green OBE BA RAF, a British RAF fighter pilot, ThrustSSC became the first land vehicle in history to exceed the speed of sound when on October 15, 1997, the car powered to a physics-busting 763.065mph (1,228.034km/h). The car broke the sound barrier on both the north and south runs of the record attempt, and the record-breaking run came exactly 50 years and one day after US Air Force test pilot Charles Elwood ‘Chuck’ Yeager became the first pilot to travel faster than sound. In the final years of the nineteenth century, 100 mph seemed like an absurd pipedream. But inevitably, as technology advanced alongside aspiration, cars got quicker and quicker. Breaking the sound barrier wasn’t simply a case of strapping the biggest available jet engines onto the side of an enormous bullet; it was a remarkably complex, yet ultimately successful, feat of science, technology, design and engineering. 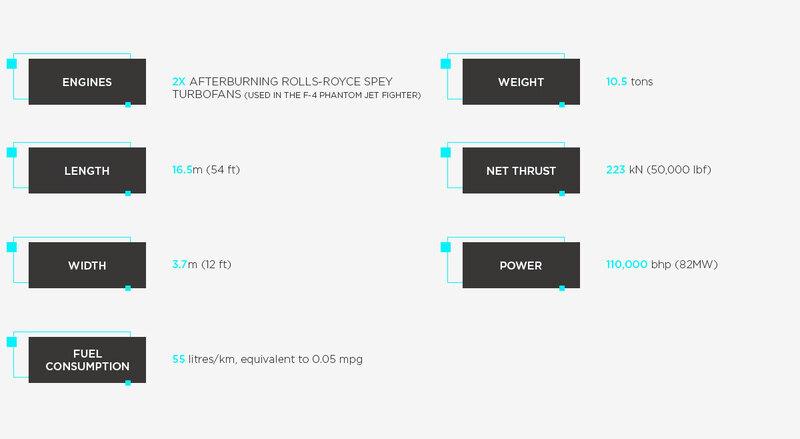 There will be issues with wheel design, testing the jet engines at such high speeds (and at such low altitude), drag forces, the weight and volume of fuel and oxidant, as well as physically finding a track that can cope with the acceleration and deceleration of such phenomenal speeds.